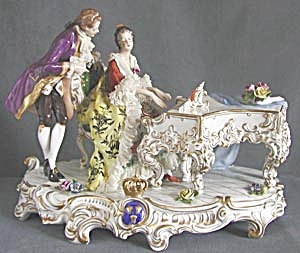 Magnificent 14"x8" hand painted Dresden figural piece of two lovers at a piano. She is dressed in an elaborate gown with lots of frothy lace. He is dressed in a purple and gold topcoat with lace jabot and cuffs. The piano is highly decorated with raised design accented in gold. There is a light blue piano scarf and vase of flowers. Has the Dresden crown mark on front in cobalt, with large gold crown on top of seal. Another mark is on the 'floor' towards the back that says Germany. The piece is c. 1900.